Primary Pulmonary Hypertension of PPH is basically a type of lung disorder. This disorder is caused by another disease called lung vasculature which is the result of increased levels of blood pressure in the pulmonary vein, artery or the capillaries. The disease further causes shortness of breathe, dizziness, fainting and various other symptoms which can get exacerbated with exertion. Primary Pulmonary Hypertension is incurable and serious but it is fortunately rare. It results in the constriction of the blood vessels located in the lungs and the pulmonary artery. If it is left untreated, it can result in the failure of the right side of the heart. 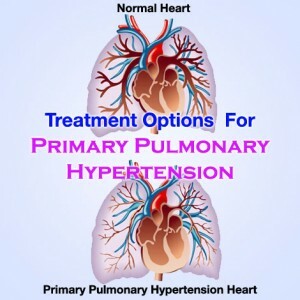 There is no perfect cure for this disease but Primary Pulmonary Hypertension Treatment options can always help in improving the quality of life of the patient. Lung transplant is considered one of the best Primary Pulmonary Hypertension Treatment options for people who are less than 65 years of age. This is an effective treatment for patients who do not respond to the treatment including prescription drugs. Certain medications like vasodilators help in dilating the blood vessels located in the lungs. The dilation is of good help in reducing blood pressure which further helps in relieving the strain on the heart. The use of these drugs should always be evaluated by undergoing tests because they can cause certain serious side effects. This is a type of open-heart surgery that can be an effective treatment option if medications are of no help. The surgery involves creating an opening between the right and left chambers of the heart for relieving pressure exerted on the right side of the heart. Doctors might recommend breathing pure oxygen for patients suffering from Primary Pulmonary Hypertension. This type of treatment is called oxygen therapy in it helps in treating high altitude PPH especially in patients who also suffer from sleep apnea. Anticoagulants are blood thinning drugs that can serves as an effective treatment option for PPH. These drugs discourage blood clotting in the lungs.